Portal 2 has been pushed back to 2011, which may have something to do with the cancellation of Valve's E3 event - which, by the way, Valve would like to remind you will be Portal themed so stop creating silly rumors. My oh my, what is this? A Valve game has been delayed from its intended release? The sky must be blood-red, the seas must be boiling, for the apocalypse is surely upon us! What's next? Will Blizzard fail to lock down a release date for Diablo III? Will Nintendo announce a new title featuring Mario? Will Hideo Kojima's next game be a confusing, philosophical mess?! This is a strange and bizarre new world we find ourselves in! Erm, I got a bit distracted there. Sorry about that. The following just showed up as a missive from Valve, confirming that Portal 2 would not be released this year as had been intended. Like you're surprised. 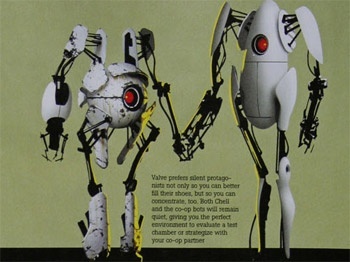 June 9, 2010 -- Aperture Science, doing business as Aperture Laboratories LLC, in partnership with Valve today announced the successful completion of an ethics-review-panel-supervised release date restructuring process. Portal 2, the sequel to the ground-breaking title that earned over 30 Game of the Year awards despite missing its original ship date, is now targeted for a 2011 release. Representatives from both companies acknowledged that public safety concerns factored into the decision. They went on to say that even though Portal 2 will arrive slightly later than planned, all life on earth won't instantaneously stop as every molecule in your body explodes at the speed of light, which is what would happen should a rip ever appear in the fabric of Valve Time. "Also, the game will be even better," they added, missing an historic opportunity to create the first product delay press release to mention that a product is being delayed to make it worse. To ask questions about how close we all came to dying, or to ask futile questions about the previously announced E3 ***PORTAL-2-THEMED-FOR-GOD'S SAKE*** surprise or, less futilely, to schedule an appointment to attend a Portal 2 screening at the Valve booth during E3, please contact Valve's delegate to the EU's Valve Time Studies Group, Doug Lombardi. Those guys really do have the best press releases, don't they? Other than confirming that Portal 2 would be delayed like Portal 1, the announcement stressed that the Valve E3 Surprise was Portal-related. That's right, folks: No Source Engine 2, no Half-Life 3, no Half-Life 2: Episode 3, and for Pete's sake, certainly no Duke Nukem Forever. Just Portal. Wow, it's almost like they'd like people to stop creating unfounded rumors or something.